The domestic cat is a typical feline pet without a pedigree. They may also be called house cats and the British use the term moggies. They are all Felis silvestris catus. A lack of papers to show they are purebred no way detracts from them being beautiful, noble, and loving companion animals. Domestic cats can be large, small, fat, or thin, depending on their lineage, diet, and degree of care. In cat shows that allow them, domestic cats are usually in a class called "Household Pets" or "Domestic Cats." A mixed breed cat is one that is a cross between cats of two different breeds or a purebred cat and a domestic cat. If your cat resembles a known cat breed you may call him a mix. However, without registration papers from a breeder, you won't be able to enter him in a cat show as a specific breed. Coat and Color: Domestic cats are often broken out into groups of shorthaired (DSH), longhaired (DLH), and medium length hair (DMH). Colors include black, white, gray, and red (orange). Color patterns include tabby, calico, tortoiseshell, and tuxedo. Life Expectancy: 14 to 20 years for indoors cats; 3 to 10 years for outdoors cats; 4 to 5 years in the wild. Domestic cats are rich in history. Cats are believed to have been domesticated in the Middle East at about the time humans developed agriculture. A 9,000-year-old grave on Cyprus revealed a cat buried with a human, presumably due to being a companion animal. Cats served to keep rodents away from stored grain. Cats were believed to be sacred by the Egyptians and cat mummies are well-known. Cats were part of life in the city and the country, always fulfilling the role of rodent hunters. Domestic cats spread throughout Europe, Asia, Africa, and the Middle East, but were not known in the Americas or Australia until brought there by European explorers. Cats were part of sailing life (again, to control rodents on board) and this is how they were introduced to the New World. Domestic cats can revert to being feral cats and adapt to a wide variety of environments, from the desert to forests to wetlands to city streets. Some of these alley cats end up in animal shelters and the foster homes of cat rescues. The number of pet cats exceeds that of dogs, with estimates by the American Veterinary Medical Association of over 74 million pet cats in the U.S., with cat companions in over 30 percent of households nationwide. The feral cat population, by comparison, is somewhere between 25 to 60 million. Cats are usually self-cleaning and fastidious by nature. Brushing your cat will help reduce matting and may help prevent hairballs. Trim your cat's nails every two to three weeks and provide a scratching post. If your cat will let you, brush your cat's teeth regularly. Cats will usually need dental cleanings by the veterinarian. Indoor-only cats have the longest lifespans. It is difficult to keep an outdoor cat from roaming as most are good at climbing any fence. 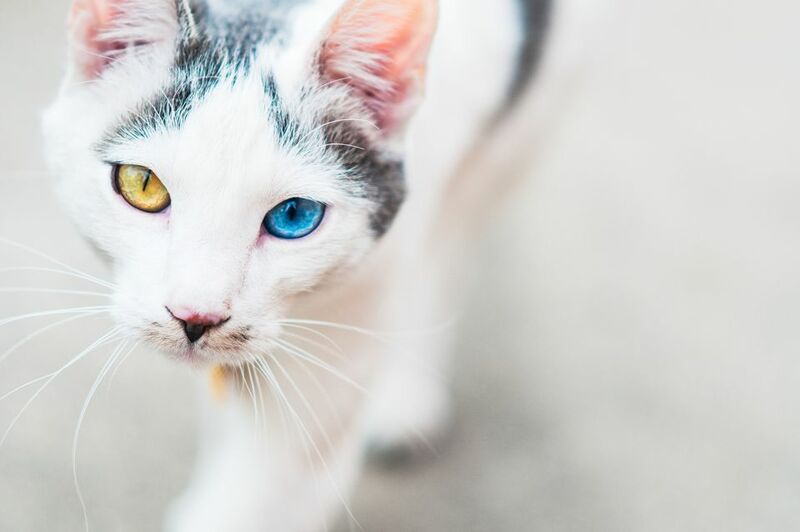 When outdoors, cats face the risks of being exposed to infections from other animals, getting into fights, being attacked by predators, or being run over by vehicles. Outdoor cats also have a large impact on birds and other wildlife. Your indoor cat needs plenty of chances to play and chase toys. You should spend time each day in active play with your cat. Some cats can be trained to walk on a leash. Cats like lots of sleep and cat naps, so provide a comfortable bed and other places around your living area where your cat can lounge and retreat. Cats have a wide variety of personalities, from standoffish to clingy. Early socialization with a variety of people can help a cat be less timid around newcomers. Cats often do well with other cats and cat-friendly dogs, especially if raised together. However, domestic cats still have predatory instincts for rodents, birds, and fish, whether or not they are pets. It's best to keep those animals safely away from your cat. Spay or neuter your pet by age 5 months if you don't intend to breed your cat. Be sure to stay up-to-date on veterinary visits and vaccinations to prevent common and serious problems. Cats are naturally carnivores and require taurine in their diet. A wet food diet is often considered best, but you can leave out dry food for your cat to snack on as well. Discuss your cat's needs with your veterinarian, especially if your cat has diabetes, is obese, or is older. It is good to monitor your cat's weight and take steps to prevent excess weight gain, which can shorten your pet's lifespan. Provide fresh, clean water for your cat at all times. Before you decide to adopt a domestic cat, be sure to talk to other cat owners, reputable breeders, and rescue organizations. There are many loving domestic cats of every shape, size, coat, and pattern awaiting their forever homes at shelters. There are many cat breeds out there. With a little research, you can find the right one to bring home.